For other uses, see Regicide (disambiguation). Before the Tudor period, English kings had been murdered while imprisoned (for example Edward II or Edward V) or killed in battle by their subjects (for example Richard III), but none of these deaths are usually referred to as regicide. The word regicide seems to have come into popular use among foreign Catholics when Pope Sixtus V renewed the papal bull of excommunication against the "crowned regicide" Queen Elizabeth I, for—among other things—executing Mary, Queen of Scots, in 1587. Elizabeth had originally been excommunicated by Pope Pius V, in Regnans in Excelsis, for converting England to Protestantism after the reign of Mary I of England. The defeat of the Spanish Armada and the "Protestant Wind" convinced most English people that God approved of Elizabeth's action. After the First English Civil War, King Charles I was a prisoner of the Parliamentarians. They tried to negotiate a compromise with him, but he stuck steadfastly to his view that he was King by Divine Right and attempted in secret to raise an army to fight against them. It became obvious to the leaders of the Parliamentarians that they could not negotiate a settlement with him and they could not trust him to refrain from raising an army against them; they reluctantly came to the conclusion that he would have to be put to death. On 13 December 1648, the House of Commons broke off negotiations with the King. Two days later, the Council of Officers of the New Model Army voted that the King be moved from the Isle of Wight, where he was prisoner, to Windsor "in order to the bringing of him speedily to justice". In the middle of December, the King was moved from Windsor to London. The House of Commons of the Rump Parliament passed a Bill setting up a High Court of Justice in order to try Charles I for high treason in the name of the people of England. From a Royalist and post-restoration perspective this Bill was not lawful, since the House of Lords refused to pass it and it failed to receive Royal Assent. However, the Parliamentary leaders and the Army pressed on with the trial anyway. At his trial in front of The High Court of Justice on Saturday 20 January 1649 in Westminster Hall, Charles asked "I would know by what power I am called hither. I would know by what authority, I mean lawful". In view of the historic issues involved, both sides based themselves on surprisingly technical legal grounds. Charles did not dispute that Parliament as a whole did have some judicial powers, but he maintained that the House of Commons on its own could not try anybody, and so he refused to plead. At that time under English law if a prisoner refused to plead then this was treated as a plea of guilty (This has since been changed; a refusal to plead now is interpreted as a not-guilty plea). On the day of his execution, 30 January 1649, Charles dressed in two shirts so that he would not shiver from the cold, lest it be said that he was shivering from fear. His execution was delayed by several hours so that the House of Commons could pass an emergency bill to make it an offence to proclaim a new King, and to declare the representatives of the people, the House of Commons, as the source of all just power. Charles was then escorted through the Banqueting House in the Palace of Whitehall to a scaffold where he would be beheaded. He forgave those who had passed sentence on him and gave instructions to his enemies that they should learn to "know their duty to God, the King - that is, my successors - and the people". He then gave a brief speech outlining his unchanged views of the relationship between the monarchy and the monarch's subjects, ending with the words "I am the martyr of the people". His head was severed from his body with one blow. 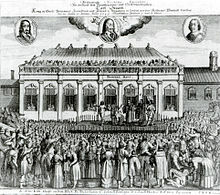 The Declaration of Breda 11 years later paved the way for the restoration of the monarchy in 1660. At the restoration, thirty-one of the fifty-nine Commissioners who had signed the death warrant were living. A general pardon was given by Charles II and Parliament to his opponents, but the regicides were excluded. A number fled the country. Some, such as Daniel Blagrave, fled to continental Europe, while others like John Dixwell, Edward Whalley, and William Goffe fled to New Haven, Connecticut. Those who were still available were put on trial. Six regicides were found guilty and suffered the fate of being hanged, drawn and quartered: Thomas Harrison, John Jones, Adrian Scrope, John Carew, Thomas Scot, and Gregory Clement. The captain of the guard at the trial, Daniel Axtell who encouraged his men to barrack the King when he tried to speak in his own defence, an influential preacher Hugh Peters, and the leading prosecutor at the trial John Cook were executed in a similar manner. Colonel Francis Hacker who signed the order to the executioner of the king and commanded the guard around the scaffold and at the trial was hanged. Concern amongst the royal ministers over the negative impact on popular sentiment of these public tortures and executions led to jail sentences being substituted for the remaining regicides. Some regicides, such as Richard Ingoldsby were pardoned, while a further nineteen served life imprisonment. The bodies of the regicides Cromwell, Bradshaw and Ireton which had been buried in Westminster Abbey were disinterred and hanged, drawn and quartered in posthumous executions. In 1662, three more regicides John Okey, John Barkstead and Miles Corbet were also hanged, drawn and quartered. The officers of the court that tried Charles I, those who prosecuted him and those who signed his death warrant, have been known ever since the restoration as regicides. 1898 Empress Elisabeth of Austria by Luigi Lucheni, an anarchist in Geneva. 1908 the Guangxu Emperor by arsenic poisoning, perhaps on orders from Empress Dowager Cixi or Yuan Shikai. 1936 George V of the United Kingdom by Bertrand Dawson, his personal physician. 1946 Ananda Mahidol of Thailand. The King's death is still a mystery and may have been either regicide or suicide. The subject is never openly discussed in Thailand. 1975 Haile Selassie I of Ethiopia, widely suspected to have been murdered in his sleep by asphyxiation on the orders of the Derg junta, which had deposed him a year prior. Note that some of the aforementioned monarchs, such as Nicholas II and Haile Selassie, have already ceased to be rulers at the time of their deaths. Regicide has particular resonance within the concept of the divine right of kings, whereby monarchs were presumed by decision of God to have a divinely anointed authority to rule. As such, an attack on a king by one of his own subjects was taken to amount to a direct challenge to the monarch, to his divine right to rule, and thus to God's will. The biblical David refused to harm King Saul, because he was the Lord's anointed, even though Saul was seeking his life; and when Saul eventually was killed in battle and a person reported to David that he helped kill Saul, David put the man to death, even though Saul had been his enemy, because he had raised his hands against the Lord's anointed. Christian concepts of the inviolability of the person of the monarch have great influence from this story. Diarmait mac Cerbaill, King of Tara (mentioned above), was killed by Áed Dub mac Suibni in 565. According to Adomnan of Iona's Life of St Columba, Áed Dub mac Suibni received God's punishment for this crime by being impaled by a treacherous spear many years later and then falling from his ship into a lake and drowning. Even after the disappearance of the divine right of kings and the appearance of constitutional monarchies, the term continued and continues to be used to describe the murder of a king. He was first tortured with red-hot pincers; his hand, holding the knife used in the attempted murder, was burnt using sulphur; molten wax, lead, and boiling oil were poured into his wounds. Horses were then harnessed to his arms and legs for his dismemberment. Damiens' joints would not break; after some hours, representatives of the Parlement ordered the executioner and his aides to cut Damiens' joints. Damiens was then dismembered, to the applause of the crowd. His trunk, apparently still living, was then burnt at the stake. 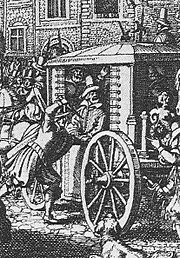 In Discipline and Punish, the French philosopher Michel Foucault cites this case of Damiens the Regicide as an example of disproportionate punishment in the era preceding the "Age of Reason". The classical school of criminology asserts that the punishment "should fit the crime", and should thus be proportionate and not extreme. This approach was spoofed by Gilbert and Sullivan, when The Mikado sang, "My object all sublime, I shall achieve in time, to let the punishment fit the crime". In both the François Ravaillac and the Damiens cases, court papers refer to the offenders as a patricide, rather than as regicide, which lets one deduce that, through divine right, the king was also regarded as "Father of the country". Wikimedia Commons has media related to Regicides. ^ Kirby 1999, pp. 10,13 footnotes 12 and 17. "The record of the Trial also appears in Cobbett's Complete Collection of State Trials, Vol IV, covering 1640-1649 published in London in 1809. p. 995". ^ Kirby 1999, p. 14. ^ Pestana, Carla Gardina (2004). The English Atlantic in an Age of Revolution, 1640-1661. Cambridge, Massachusetts and London, England: Harvard University Press. p. 88. ^ Kirby 1999, p. 21 footnotes 12 and 35. "The record of the Trial also appears in Cobbett's Complete Collection of State Trials, Vol IV, covering 1640-1649 published in London in 1809. p. 1132." ^ Mu, Eric. Reformist Emperor Guangxu was Poisoned, Study Confirms". Danwei. 3 November 2008. Retrieved 2 November 2011. ^ "Ethiopian Court Hears How Emperor Was Killed". The Washington Post. December 15, 1994. Archived from the original on 31 December 2017. Retrieved 15 December 2017. ^ "The Mikado by W. S. Gilbert and Arthur Sullivan". gsarchive.net. Archived from the original on 2 October 2017. Retrieved 29 April 2018.